I realize store bought bubbles are not expensive, but making them yourself is not just more frugal, it is more convenient. It makes a big batch and I had everything I needed in my pantry, bonus! I left most of my bubbles untinted, but I used one drop each of food coloring in these three, and Lukey has loved bringing the colored bubbles outside to play. Also, how cute would these be for party favors?? I think I might stock up on plastic (aka: toddler friendly) containers (I am thinking empty peanut butter jars with the lids spray painted?) and give them as favors for the kids at Luke’s birthday in a few months. Here’s the recipe. It’s so easy it’s like a busy momma’s dream. Whisk all ingredients together in large bowl until combined. Separate into storage containers. I filled up all the empty bubble containers that I had saved first, and then went to these jars. Also, I bought a pack of bubble wands at Walmart (similar to these but cheaper) so that we will never run out of wands or bubble solution again. Can I get a woot woot?? Now go outside, play and enjoy!! 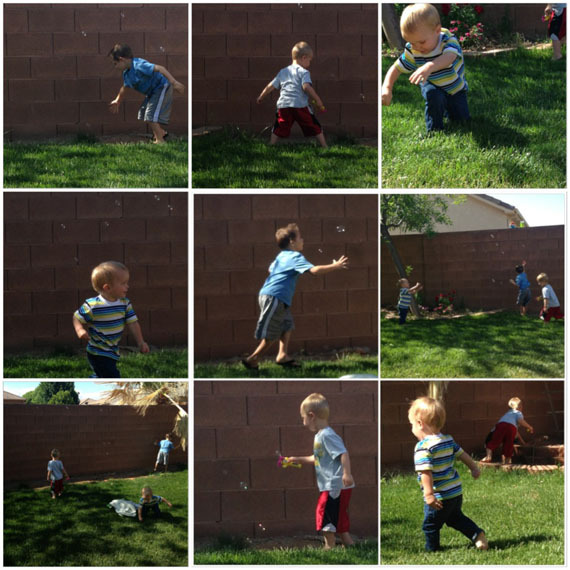 For your viewing pleasure: Luke and his two best buds trying to catch the bubbles! +This post may be linked up at one of these fabulous linky parties, check them out! +If you enjoyed this post you might also like Tie and Suspenders Onesie and Fabric Nursery Board Art! Corn syrup. i never would have guessed. I’m going to have to try this. Love this idea! I’m totally Pinning this! Totally trying this – thanks for sharing! My son LOVEs bubbles! Definitely pinning. The tinted bubbles are SO cute Jess! I’m thinking party favors for Jeff’s bday on Monday – haha :) P.S. Thanks again for watching my boys for my appt AND for my late night soda! You saved me yesterday! !